I am listening to the patter of large rain drops on our roof. Its a muggy, misty afternoon and our family's new year holiday - filled with blue sky, warm breezes and fresh country air - seems an eon ago already. If you too, are sitting somewhere grey, lean in a little closer to your monitor. Look at the blue, blue sky in this next holiday snap. Perhaps we can pretend its sunny, together? Apparently, that's not the sky after all. We're looking down a steep hill, here ... and that's water at the bottom. 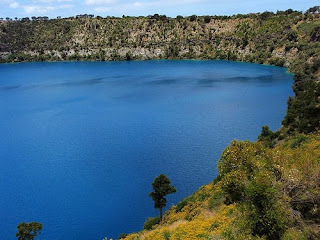 This is Blue Lake in Mount Gambier, South Australia. Isn't it the most exquisite colour? Even more beautiful than a summer sky. 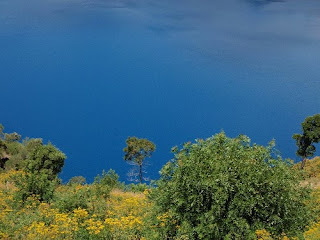 The lake is situated in an extinct volcanic crater; one of a series in the area. The city of Mount Gambier is known for its craters, sinkholes and caves. We also did a little cave exploration while we were visiting the city. 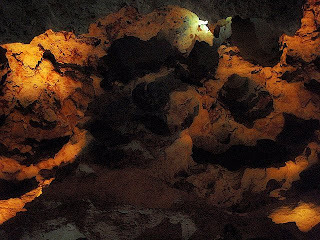 This dark, cool limestone space is Engelbrecht's Cave, which stretches underneath a number of suburban streets. We took a very interesting tour. Some of the tour party would have heard interesting facts about its formation and features and how its a popular cave diving site. Me? I mostly heard things along the lines of fault lines and collapse and how a power pole in an adjacent street mysteriously disappeared into a cavernous void one evening. My attention wandered a little as I pondered whether our parked car might suddenly drop through onto our heads. Luckily my attention was diverted as the tour guide cheerily told us that the word spelunk means "to explore caves for fun". Which is funny, because I thought it was more likely to be the noise I'd make if I lost my footing on, say, quite a steep stair case. Arrrrrggghhh ..... spelunk. 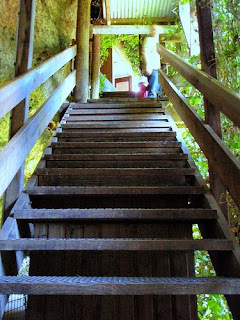 Thankfully, I managed to descend this particular set of stairs without incident. 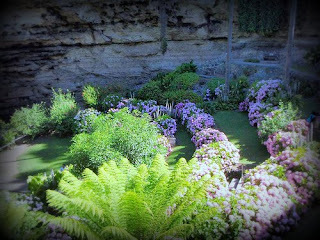 They lead to another of Mount Gambier's beautiful natural features - the Umpherston Sinkhole. 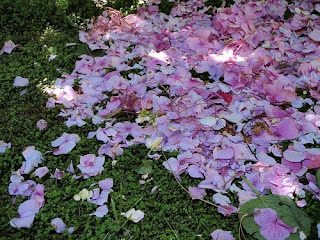 That's natural in the sense has-had-a-formal-garden-planted-smack-in-the-middle-of-it. Apparently one Mr J. Umpherston thought that this spectacular limestone sinkhole would look better as formal sunken garden. 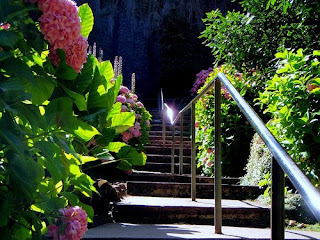 The one-time cave is full of ivy, ferns and moptop hydrangeas arranged on terraces. Planted in the late 1880s, it remains a lush green garden to this day. 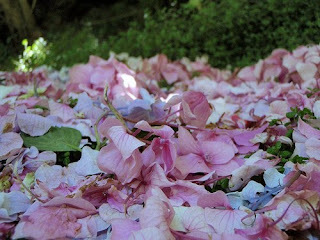 I have to say I liked the pretty hydrangeas ... and roofless cave ... very much. No cars or power poles to fall through on one's head. Open sunrise to 1am (floodlit at night). Entry fee applies. 45 minute guided tour. That reminds me of road trips as a kid.... can you still buy the little bottles of blue water as a souvenir? I think that you are confusing "spelunk" with "splat" lol. My inlaws are at the Mount. We were there for Christmas. The lake is more beautiful than photos can show, isn't it? I am guessing that you found the playgrounds for the kids. Aren't they the best? Very pretty! Grey here? Yes - much. What did the junior cavers make of all this? I did not know of this lovely lake, it is beautiful. Sounds like a lovely holiday. 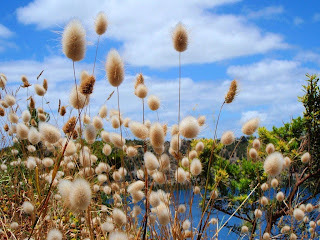 Oh, it's been a while since I've been to Mt Gambier - must return to these places again - with different eyes - older? wiser? - nah - with glasses!! Glad you're having such a lovely time! That first photo is amazing! Oh this takes me back some 38 years when we were lucky enough to live in MtGambier for some time. My second daughter was born in that beautiful city. The lake is indeed beautiful and supplies the city with its water. The other caves are fabulous too. Did you go to Tantanoola. Good caves there. Oh that's so pretty! I want to go there! I hope you're being paid lots of $$$ by the SA tourism board! You're brilliant at it! My folks just went to Mt Gambier and your photos look very much like theirs. Yours don't however, feature a border collie and my grumpy Dad with his "not another bloody photo of me and the dog" face on. Oh, I would so love to do some 'spelunking' right now. It is not natural for native born Aussies to spend 3 months inside with 3 feet of snow outside (not to mention driving one's child to the bus stop in minus 29 degree weather!). Oh for Mt Gambier..... sigh.